At the state level, the OHSAA provides forty-eight scholarships across the six OHSAA athletic districts. Forty-two students receive $1,000 awards – including one student from each of the six OHSAA athletic districts that will receive an Ethnic Minority Scholarship and six students receiving $2,000 Spirit of Sport Scholarships. In addition to the six scholarships awarded by the Ohio High School Athletic Association the Southeast District Athletic Board (SEDAB) is proud to award an additional eleven scholarships to the deserving scholar-athletes in Southeast Ohio. In conjunction with the OHSAA the SEDAB recently announced the 2015 Scholar-Athlete Scholarship awards at their annual Scholar-Athlete Banquet on June 18, 2015 in Lucasville, Ohio. 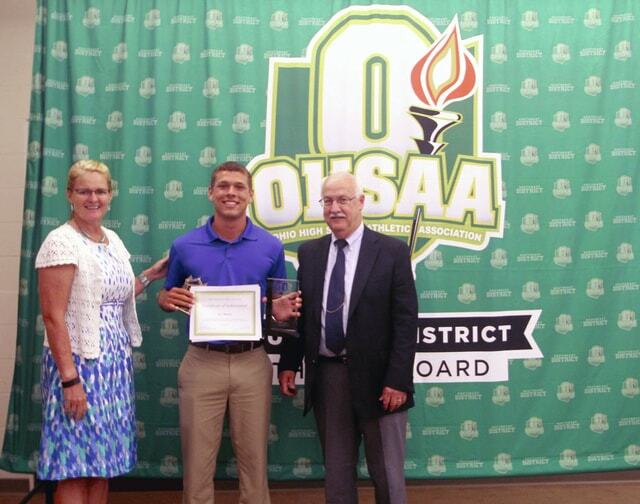 The SEDAB is pleased to announce Trey Moberly of HILLSBORO High School has been awarded the OHSAA Scholar-Athlete scholarship in the amount of one thousand ($1000). Trey plans to enroll at Youngstown State University in the fall and study Pre-medicine.